Pinhole eyeglasses are designed to help your eyes focus with less strain. Ideal for those who are nearsighted or farsighted, struggle to read fine print, or have cataracts, astigmatism or a wandering eye. Some wear them as an alternative to expensive prescription eyeglasses. Pinhole glasses are ideal for reading, watching TV or using a computer. 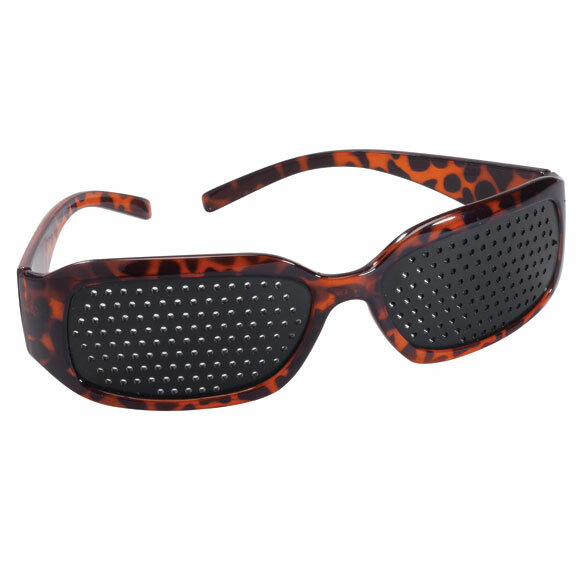 Stylish tortoise non-prescription glasses are perfect for men and women. To strengthen my eyesight. Have had to use glasses since I was nine years old. I can see far and near with these on. Just make sure you are in bright light as they are dark. Thank you for the timely delivery of my Pinhole Eyeglasses. I use them for reading. Since my eye surgery, I haven't been able to read very well. The Pinhole glasses help my eyes to focus on the words, relieve the strain and helps me to read better. They fit and feel wonderful as if they were made for me. I bought two pairs so I can use them in various areas of the house. I got the idea from my Doctor. She uses a pinhole attachment when I go for my eye exams. Whenever she flipped down that attachment, I could always read the chart better. I use these glasses for computer - it takes a bit of practice but everything comes into focus pretty easily. I like! print when the pinhole lens was dropped over my eye. The glasses help me tremendously read the small print on the TV. It's an inexpensive way to solve a eye problem. Before you order however, you might want to visit an optometrist to see if the pinhole lens helps you see better. I used it for watching tv and working on my computer. I wear glasses, but occasionally I wear pinhole glasses to watch TV or read with them. Sometimes, on trips as a passenger, I wear them to "get the eyes aligned" better. It does make a difference. It takes a few minutes to adjust when you put them on, but stay with it and you will see better. NEVER drive with them. Bought this for my husband and he really loves them. My husband has had trouble reading since his cataracts were taken off. These pinhole glasses work great! I am blind in one eye and found at the eye doctor that I could see better with a pinhole filter. I was hoping for the same result with these glasses. They aren't quite as good as the Doctor's but for the price they definitely help and it was worth it for me. They aren't for everyone but they get rid of the halos. I wouldn't drive with them since you have no side vision but the TV is much clearer. It was described as helping to see TV better. Not so! I can't see much of anything through them! I have looked through other pinhole glasses at my eye doctors office and they worked great! This pair is awful. I want to send them back, but the shipping would cost more than the refund I would get. So I am just stuck with them going in to a garage sale pile I guess? the eyeglasses did not help the holes were not clearly perforated leaving shadow at each hole nothing like what the ophthalmologist uses, eye Doctor glasses helped focused my vision. Disappointed with the pin hole eyeglasses. They don't really work for me. I have to strain and really focus in order to see out of them. Not comfortable. I don't want to put a star rating of any kind. Had a pair before but misplaced them. my wife needs these things. Back in the 90's I wore a pair of pinhole glasses and they did work. I lost them and never took the time to purchase another one. Very excited to be able to buy another pair! Had a retina detachment -- now see double images out of left eye. Hoping these glasses help draw two images together. Wanted to give these a try, recently had a floater and it has made my vision worse, hopefully these will help. Thought it would be worth a try. "To find out if they will benefit me." My daughter-in-law's mother is having trouble seeing and I thought these might help. I saw the same glasses advertised in another catalog priced at $19.99. I ordered this for my husband, who has been having a problem with seeing things close up. I am hoping these help him with that. My oldest daughter is diagnose with keratoconus and I was watching youtube and one youtuber stated that this pinhole glass helps your vision. So I will try to do everything before I submit my daughter for a procedure. With hope to increase my vision sight. I wanted to see if these glasses could assist in strengthening my eyes. I am near sighted and have an astigmatism. Curious to see if they would help my vision. Always read ; about these and wanted to try them as my eyesight is not what it used to be. I bought a pair and it helps my eyes I can read it takes a bit to focus but I can read small print and read without my reading glasses and I wear them when I'm outside even . I have had a pair for 3 years and I really like them . I also have stigmatism. My husband has lots of eye troubles, maybe these will help. my doctor uses something like this in my eye exams. Used before - REALLY WORK!!! Just wanted to try them out. where is the glass frame manufacture? can these glasses help with night vision? BEST ANSWER: No, it does not help with night vision. May help with focusing better at night, but I don't recommend driving with them on. how small are the holes? BEST ANSWER: Thank you for your question. The seem to be the size of an embroidery needle. We hope this information will be of help to you. will they fit over my glasses? The actual lens is 1 1/4 in. high & 1 1/2 in. wide surrounded by frame, so it depends on the size of your glasses. I wear large frame glasses, so they didn't work for either pair. Are these available in non-prescription - size 6X? BEST ANSWER: Thank you for your question. There is no prescription to this item. No magnification. We hope this information will be of help to you. can they be worn over prescription glasses? BEST ANSWER: Thank you for your question. No, they are not meant to be worn over your prescription glasses. We hope this information will be of help to you. Where can I buy pinhole glasses in NY area? I would like to try them before buying. BEST ANSWER: Thank you for your question. We are only online and we do not have stores. We are unsure where to find them in your area. We apologize for any inconvenience this has caused.